The Prochem Glidemaster is a lightweight 'scrub-type' solid stainless steel with insulated handle and trigger, heavy duty valve, quick connect and single spray tip. The Prochem Glidemaster is the carpet cleaning wand that comes as standard with the Prochem Steempro SX2100 and SX2700. The Prochem Glidemaster Hand Tool is a heavy duty stainless steel extraction hand tool for cleaning stairs, edges and heavy stained. 10cm (4') head with o4 spray nozzle. The new stainless steel 15cm (6”) wide Prochem Heavy Duty Stair Tool with long handle, grip and o6 spray tip. The Prochem Swivel Head Stair Tool is and innovative new stair tool which allows you to clean stairs with out turning or twisting your arms and wrists. long 76cm (30') handle with swivel head and single jet. The NEW Prochem Auto Detailer is a durable stainless steel tool specially designed to clean affectively in tight spaces. The NEW Prochem Plastic Detailer is a lower cost version of the Prochem Auto Detailer with a durable plastic head to monitor recovery. Prochem Diaphragm Pump 120psi By-Pass. This is the smallest and most compact of the SteemPro range, however don’t let this be deceiving it is a very powerful peace of equipment. The Prochem SX2000 is built to a very high standard, using high quality parts, featuring a tuff scuff-resistant body and solution tanks making this a very durable machine. 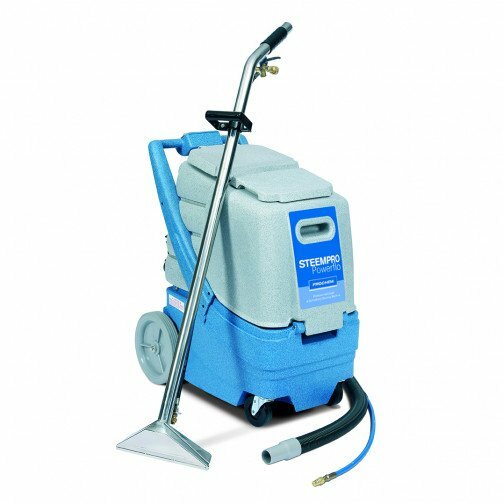 This machine is one of the latest and most advanced carpet cleaners in Prochem’s market leading range of portable soil extractors. Ideal for single operator use it is a very high-powered carpet extractor incorporating one powerful 3 stage vacuum and a 120psi pump system with an internal whisper quiet silencer making it one of the most powerful yet quiet portable extractors in the world. The SX2000 along with the other Prochem SteemPro carpet cleaning machines is one of the most popular machines in the UK and are even used by royal appointment to clean carpets and upholstery for the royal family. If you are just starting out as a carpet cleaner or are experienced in the industry we would highly recommend using one of these machines. The SX2000 is very easy to use, and despite its large capacity will comfortably fit in a small van or most large cars. Due to its large clean water and recovery tanks it allows you to clean a very large area without having to change or empty water too often saving you time and money. It comes with a 4.6 meter (15ft) hose so you don’t have to spend time moving the machine around, and in some cases you could even leave the machine outside if needed whist cleaning inside. With the addition of one of Prochem’s hand tools you can easily reach up or down stair cases leaving no step uncleaned.